We are happy to announce that Ghost is now available in BitNami! For those of you that are not familiar with Ghost, it is a Kickstarter crowd-funded blogging platform dedicated to one thing: Publishing. It is well designed, completely customizable and Open Source. 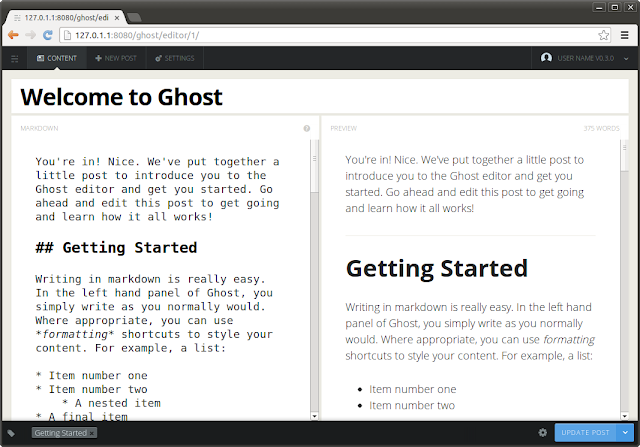 Ghost allows you to write and publish your own blog with a simple, clean and focused user interface. It also has a smart writing screen. Markdown is presented on the left and a live preview is provided on the right. Ghost also includes a simplified, customizable analytics dashboard. BitNami Ghost is a self-contained, easy to use distribution that makes it simple to get started with Ghost. To get started, you can download free, ready-to-run installers for Linux,Windows and Mac OS X, virtual machine images (VMs) and cloud images for the Amazon and Azure clouds. If you just want to check out Ghost, you can instantly launch a free cloud demo server with the BitNami Cloud Launchpad by clicking the button below. Thanks to the help of John O'Nolan and Hannah Wolfe, co-founders of Ghost, for their help with building the BitNami Ghost packages. Try Ghost in an instant in the cloud for free!